The latest Royal Bank of Scotland Report on Jobs said permanent staff appointments in Scotland increased at a “marked rate” at the end of 2018 while temporary billings also rose sharply. In both cases, the expansion was faster than for the UK as a whole. Meanwhile, permanent and temporary job openings increased again in December. Falling labour supply led to further pressure on pay. Scottish recruitment agencies pointed to a further increase in permanent staff appointments during December. The rate of growth accelerated and was among the sharpest recorded since data collection began 20 years ago. The rise outpaced that recorded for the UK overall, where growth slowed to a 20-month low. Temporary staff billings in Scotland also rose, continuing the upward trend which started one year ago. The pick-up was sharp and as with permanent placements, was stronger than the UK average. Job vacancies rose further in the latest survey period. Recruiters registered higher vacancies for temporary staff in Scotland during December. Across the monitored sectors, demand was strongest for short-term nursing, medical and care workers. The supply of permanent labour “deteriorated substantially” and at the quickest rate in one year during December. Shortages of temporary staff were also apparent during the latest survey period. The supply and demand imbalance for staff across the Scottish labour market contributed to another month of increasing pay. Salaries award to permanent starters rose sharply in December, despite the rate of inflation moderating for a second month running. Short-term staff also received higher wage rates during the latest survey period. Sebastian Burnside, Chief Economist at Royal Bank of Scotland, said: “Scotland’s labour market ended the year on a very strong footing according to latest survey data. “Permanent and temporary staff appointments are continuing to rise sharply, while demand for both types of employees grew at marked rates. “However, challenges to the jobs market are presented via the supply-side. 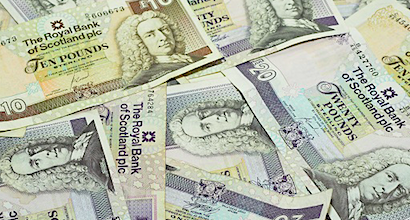 “We continue to see Scottish recruiters reporting severe deteriorations in candidate availability, which is ultimately pushing up rates of pay for both short-term and permanent roles.